Product prices and availability are accurate as of 2019-04-20 08:57:17 UTC and are subject to change. Any price and availability information displayed on http://www.amazon.com/ at the time of purchase will apply to the purchase of this product. Author Bookstand is proud to offer The Diary of Pink Pearl Continues: The Quadrilogy Volume Three by Bookstand Publishing. Bookstand Publishing offers books by the best indie authors throughout North America and the world. Bookstand Publishing is dedicated to offering original content to a broad audience and promoting great authors, literacy, and freedom of expression. The Diary of Pink Pearl Continues: The Quadrilogy Volume Three has generated a lot of interest and excitement and we think it would be an excellent addition to your library. Because the multi-talented, world-famous Tony Sanchez has graciously offered to sell custom-commissioned paintings in order to show his support for Pink Pearl's Parrot Rescue and parrot rescues around the world, I'm dedicating Volume three of my quadrilogy to him beginning with a four page full-color layout of his outstanding bio. Daniel Oropeza, is hosting the first annual fundraiser to support our organization, featuring sculptures by Donjo,Designs, signed and numbered Giclées by Michael Parkes, Tony Sanchez, myself and many other avian and art enthusiasts. Daniel's full-color bio is featured in the final pages of this colorful volume as well. Please contact me at Pearly.bird@yahoo.com if you would like to have Tony, Daniel and or Donjo create a custom painting or sculpture of your loved ones. A portion of the commissioned work will be contributed as a tax-deductible donation to our non-profit organization. All artists who step forward to follow in these caring artist's footsteps will be featured in volume four of my quadrilogy to pay it forward by promoting your artistic endeavors internationally. 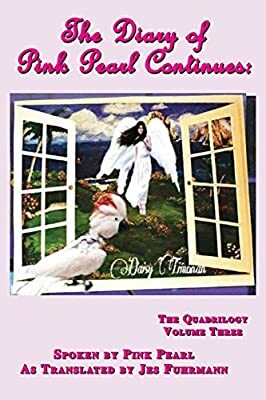 Please enjoy Volume three of my first quadrilogy, created with international love and kindness by gifted poets, artists, singer-songwriters and avian enthusiasts worldwide as Pink Pearl continues to march forward, one talon at a time to unite the world together for a great cause.